Lay out the field lengthwise in convenient lands or sections as shown by the back furrows in Fig. 38. The width of the lands will vary according to the field size; however, make the lands as near ten rods in width as possible. Should the lands be too narrow, time will be lost in turning at the headlands and in completing dead furrows; if too wide, time will be lost in driving across the headlands. Plow a shallow marker furrow across each end of the field, parallel with and 20 feet from the end, to act as a guide in keeping the headlands straight. Set up a target at each end of the field to indicate the line of the first back furrow. Plow a furrow between the headland marks, using the target as a guide to keep the furrow straight and parallel with the edge of the field. Turn and plow a second furrow against the first to complete the back furrow. 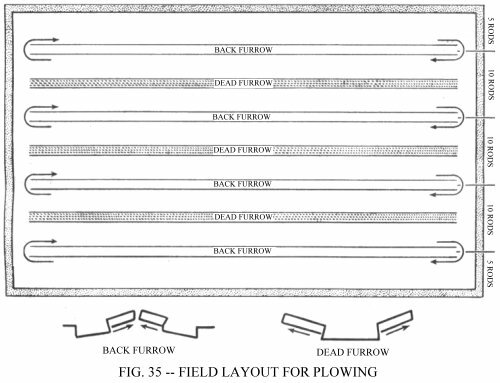 It is advisable to have the plow set to turn a shallow furrow and use care that the second furrow does not overlap the first, otherwise an objectionable ridge will be formed the length of the field. Next adjust the plows for standard depth and plow around the back furrow until the unplowed space at the side of the field is equal to the width of the headlands previously marked off. Throw a new back furrow in the same manner at the next back furrow line and plow around it until the unplowed portion between the lands equals that which has been plowed around the new back furrow. To reduce driving distance, plow around the unplowed portion between the two back furrows until it is completed to form a dead furrow. When plowing the dead furrow, set the plows shallow to prevent forming an objectionable trench the length of the field. Continue with new lands, started by back furrows, until the width of the unplowed ground at each side of the field equals the marked-off headlands at each end of the field. If it is desired, to prevent close turns, the operator may plow one side of a back furrow returning across the field plowing the opposite side of the next back furrow. Plowing around the two back furrows until the two plowed sections are wide enough to allow easy turns may save some time. Next plow the headlands around the field. Plow the ground out toward the edge: next time the field should be plowed in toward the centre. If it is decided to plow “out”, start at the outer edge, plowing around the field until the headlands are completed. This will leave a dead furrow around the field at the inner edge of the headlands. To plow “in”, start at the inner edge of the headlands and the dead furrow will be at the outer edge of the field. To satisfactorily operate most power-driven equipment, the operator should know the speed of the power take-off shaft or the belt pulley as well as the vehicle ground speed. A great variety of speeds are made available by the manual governor control, the gear ratios in the transmission and transfer case and by interchanging the gears in the power take-off housing. The tables below indicate the speeds for each of the nine positions of the manual governor control. Note that the shaft speeds are all computed with the vehicle in four-wheel drive and that of the belt pulley in the transmission drive only. Reference to these tables will be of material assistance especially in the operation of the farm combine or grain seperator. Pulley Speeds (R.P.M.) -- 8" Pulley. Power Take Off Gear Ratios.